My Mom just created this awesome Super Mario cake for my nephew's 10th Birthday Party. 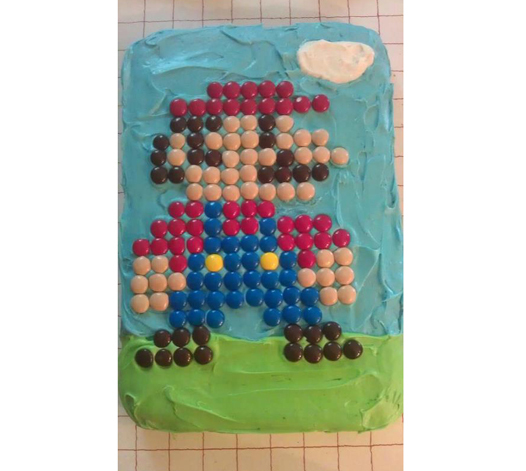 She used M&M's and Almond Joy Pieces for the flesh colored bits of this adorable 8-bit Mario. With seven children, and seven grandchildren mom has created over hundreds of birthday cakes! Her themed birthday cake creations are very thoughtful and as unique as the individual having a birthday! Thank you for celebrating the awesome in all of us, mom! Where in heaven's name did you find flesh colored M&M's (or Smarties)?